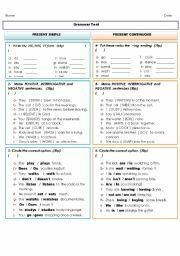 2 pages: revision of present simple and continuous; should; past simple and cont;can and could ;must and mustn`t ; going to; have to and don`t have to. 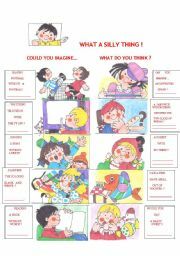 Sts read the texts, give their opinion and create new silly things orally and in written form as well. 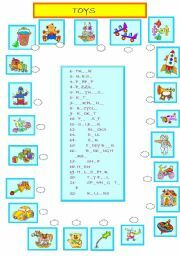 Sts well review last year main contents.IT`s a reading and writing test.They read personal information,scan data and write about themselves so that new sts can introduce themselves . 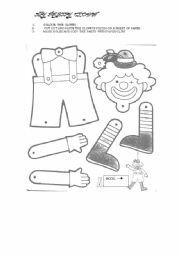 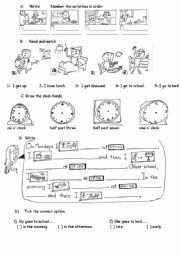 Sts draw clock hand according to written information,then they should write when the character does some activities. 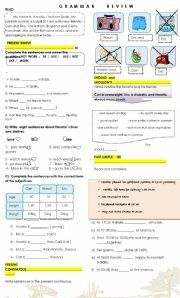 Sts will revise vocavulary ,comprehend a simple short text. 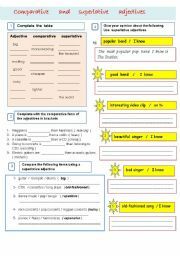 theme: music ; grammar content : use of the comparative and superlative form of adjectives. 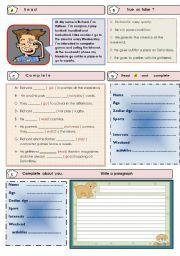 1- vocabulary, 2- sentence completion, 3- writing with prompts, 4- personal writing. 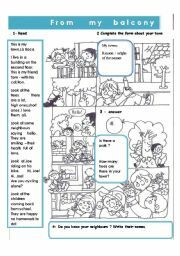 Sts read rhymes about a girl`s neighbourhood/town.then they complete a form with their own town data ,and they answer some questions.